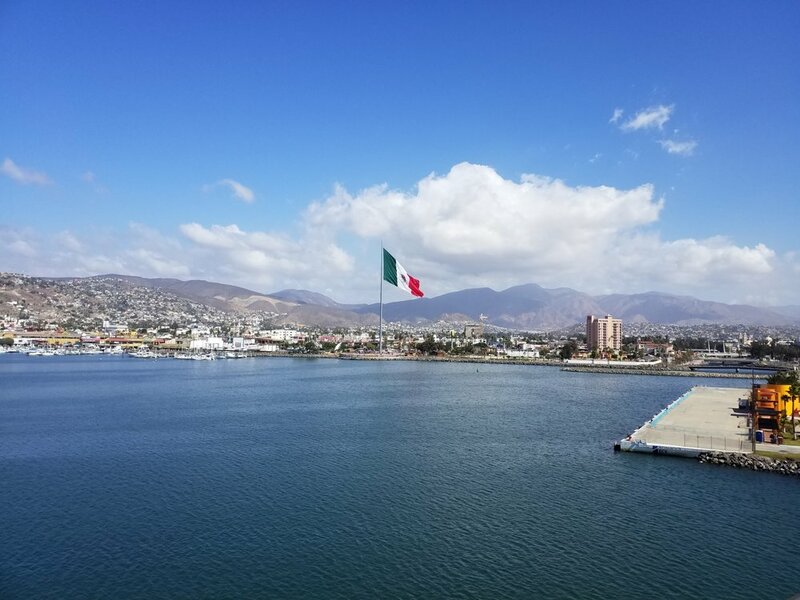 This is a review of the Carnival Inspiration 3-day sailing from Long Beach, CA to Ensenada on October 5, 2018. I have never sailed on Carnival before so in order to justify an opinion, I figured I would try them out on a very inexpensive, short cruise. This was the fastest and smoothest embarkation I have ever experienced on any cruise! After being dropped off by an Uber, we were met immediately by a greeter who was very friendly and guided us in the correct direction for the entrance to the terminal, a very cool white dome. I purchased the Faster to the Fun pass so that we could have priority boarding with a dedicated line. Our boarding time was noon and we arrived right on the nose, and to our surprise, there were no lines at all! We passed through the doors and were greeted again by another terminal agent at a table before going through security. She checked our boarding passes and passports and that was it! We were able to head straight up the ramp and across a long bridge onto the ship, no need to wait in line for a key, have a photo taken, or provide my credit card like on previous cruises. The other great thing about the Faster to the Fun is that we were able to head straight to our cabin, which was already ready and had our keys on the outside in an envelope. I have heard before that the inside cabins are the largest of any at sea. Normally, I prefer a balcony but I wanted the least expensive option on this cruise. It turned out that it was very spacious with lots of storage. And the bathroom was very large, especially the shower. Even though this was a really old ship, everything in the cabin was in pretty good shape. Since we already had our keys, we headed up to one of the bars, the RedFrog Rum Bar, to get our stickers for the Cheers! drink package that we purchased. Even though there was a limit of 15 alcoholic drinks in a 24-hour period, this was a very good deal, as you can have any drink valued up to $50. I didn’t see any expensive wines by the glass, but being able to try premium rums or get an upscale vodka (Grey Goose) was a win-win. The bonus was that the package included specialty coffees at Cafe des Artistes and bottled water. 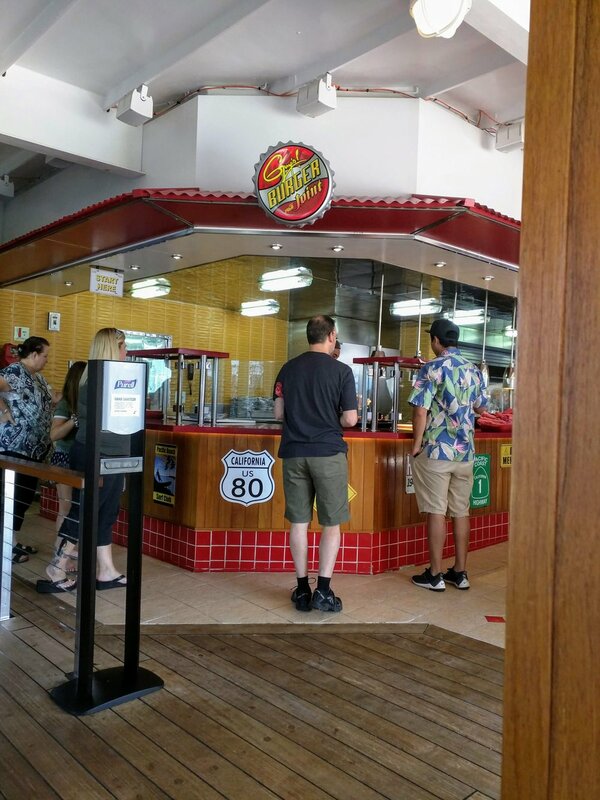 While I am not a fan of Guy Fieri, his Burger Joint has the best cheeseburgers I have ever had at sea. They are continuously made in an assembly line fashion, so they are hot and juicy. And the short line moves fast. The fries were crispy and seasoned to perfection. They lived up to their moniker, “like crack”, as someone said in a review I read. Also of note was the Pizza Pirate. Pizzas are made to order so there is a little bit of a wait (and a long line during late evenings), but they are well worth it. Crusts were thin and crispy and again, the best I have had on any cruise. Not to be missed was the SeaDay Brunch in the main dining room. The menu was very extensive and the huevos rancheros that I had was excellent. This is a screaming deal. For $75 plus gratuity, you get this amazing 10+ course gourmet meal including wine! Housed in the Shakespearean library, our group was the envy of everyone outside in the atrium looking in on our culinary adventure. I really wanted to enjoy this ship without the crowds, so when we docked at Ensenada, we only got off briefly to buy souvenirs in the terminal. Fortunately, there were several vendors with cool things like wind chimes, bobble head animals, pottery, and handmade magnets. Then, we headed back onto the ship and parked ourselves in the deserted Serenity, adults-only area at the back of the ship. It had a great view of Ensenada and it was nice to be able to sit in an uncrowded jacuzzi with glass of pinot grigio. The comedians (there were 2 each night) in the Candlelight Aft Lounge (Punchliners) were raunchy, rude, and hilarious. They do have PG-rated shows that were very tame, but the late night performances were the best. The food in the main dining room, the Mardi Gras for us with anytime dining, for dinner was abysmal. The chicken tenders were barely lukewarm and so tough, you needed a sharp knife. The roast chicken also seemed like it died in the window, barely hot, paired with cafeteria-style mashed potatoes and gravy that seemed like it came from a packet. Service was a little slow; the food took a very long time, which may explain why it was colder than expected. We only ate here once. We popped in on a couple of the shows in the Paris lounge. The broadway-style show was very tacky and amateurish but risque, with one guy having his clothes ripped off down to boxers. The other was a childlike show with an animated towel, like the ones you get in the stateroom, with audience participation. I hated having to walk through clouds of smoke on Deck 8 by the Violin’s Bar, next to the Casino. This is the only way to get from one end to the other, and the air filters couldn’t keep up with the smoking. Carnival really does live up to its reputation as a Fun Ship. From the congo line and hip music by the pool to the hairy chest contest, the demographic is young (I rarely saw anyone in the 70s or 80s) and for those that want to have a good time. It is also a really good value.